At VMworld 2018, chipmaker AMD revealed a new flagship dual-GPU for data center visualization workloads, the Radeon Pro V340, set to release in the fourth quarter of 2018. AMD also announced that it would be turning to TSMC for all its 7nm processor manufacturing needs, after long-time fabrication partner GlobalFoundries revealed a ‘strategic shift’ that will see it abandon both 7nm process and traditional CPU manufacturing, to focus on more profitable operations. 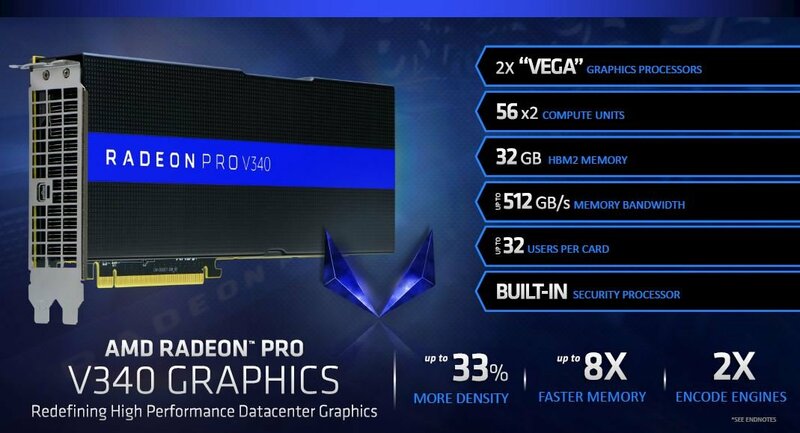 The Radeon Pro V340 was designed using AMD’s 14nm Vega architecture, with hardware-based GPU virtualization enabled by the company’s proprietary MxGPU technology. It supports up to 32 virtual machines with 1GB of memory each, which the company says is 33 percent more than the competition (Nvidia Tesla P40 supports up to 24 1GB VMs). 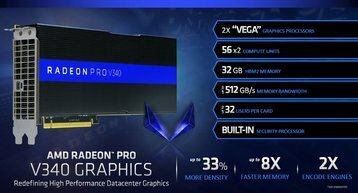 “As the flagship of our new Radeon Pro V-series product line, the Radeon Pro V340 graphics card employs advanced security features and helps to cost effectively deliver and accelerate modern visualization workloads from the data center,” Ogi Brkic, general manager of Radeon Pro at AMD, said. Sheldon D’Paiva, director of product marketing at VMware, added: “The AMD Radeon Pro V340 graphics card will enable our customers to securely leverage desktop and application virtualization for the most graphically demanding applications. The dual-GPU system has a thermal design power (TDP) of 300W, but according to the press release, can be passively cooled. Looking further ahead, AMD plans to start shifting to 7nm process for its chips - first with a 7nm machine learning Radeon Instinct GPU for later this year, and the next generation of Epyc server CPUs for 2019. Unlike Intel, AMD does not actually manufacture its own processors, turning to partners like Taiwan Semiconductor Manufacturing Company (TSMC) and GlobalFoundries for the physical creation of the product. For 7nm, AMD plans to rely exclusively on TSMC, after GlobalFoundries announced it would cede this market. GF has put its 7nm FinFET program “on hold indefinitely” - something that will “require a workforce reduction” of five percent - as it plans to focus on improving its 14/12nm FinFET programs. “The vast majority of today’s fabless customers are looking to get more value out of each technology generation to leverage the substantial investments required to design into each technology node,” the company’s new CEO Tom Caufield said. Talking to Anandtech, CTO Gary Patton claimed that the move had nothing to do with technical issues, but rather market forces. GF is owned by the United Arab Emirates’ sovereign wealth fund Mubadala Investment Company, which earlier this year revealed that it would start to focus on increasing profits. “The culture of [our investments], the ones I’ve been involved with, was about accumulating assets and then just maintaining it,” Mubadala CEO Khaldoon Al Mubarak told Bloomberg in May. The company also spun off its ASIC division, which will need access to smaller nodes, and so will be able to use “alternative foundry options” at 7nm and beyond, probably from competing foundries. In 2016, AMD and GF entered into a five-year Wafer Supply Agreement that guaranteed that AMD will purchase a set number of wafers from the company or face levies. It is not clear if that will be renegotiated, although AMD will continue to use GF for 14nm and 12nm products.